Welcome to Inter Casino, the online gambling market leader by their own words! While they are probably not #1 as it’s stated, InterCasino.com is definitely among the top casinos and online gambling sites of the new era. Though the brand was actually around at the time online gambling industry kind of took off. Unlike most ”dinosaurs” in online gambling, Inter seems to really follow what the trends are and strive to deliver exactly what players are looking for. This is generally not the case with casino sites that are in this industry for more than 10 years. Generally sites stay outdated and try to earn their fortune through the old customers they gained years before, when online gambling was not among the most saturated and competitive industries out there. 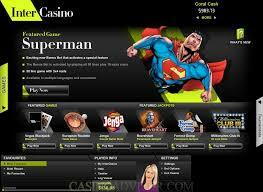 Cryptologic is the software provider and game developer behind casino gambling games that are offered by InterCasino. In total there are about 150 of these with all of them being available in an instant, flash based casino version. No download of any software or installer is needed and you can play games directly from your browser. Though, one major leak that is not offered by the casino is mobile compatibility. Turns out that InterCasino does not have a mobile casino version developed. Though, if your mobile phone or tablet device is modern enough, you might be able to play them anyway – via the regular, computer version of the casino. The truth is that InterCasino actually uses software from several other providers, rather than just Cryptologic. These are Aristocrat and NYX Interactive, both of whom are quite well known for their slot machine games. The two are quite unusual and not greatly known in the slots world, which is exactly why Inter have decided to work with them, at least I suppose so. Lets follow up with the top 5 new games offered at this casino, in my own opinion of course. Money Farm – a completely unique and unorthodox slot game, which is hardly a slot machine to be fair. Instead of having spinning symbols on the reels, it offers you to open 6 different door, each of who hides a different arm animal and a multiplier that could potentially be applied to your wager, should three animals of the same be revealed behind the door. Fire Flies – a classic title and one of the few new games Cryptologic have developed recently. It tells a story of a big brown bear who has gone camping and is about to spend a night in tent. Surprisingly it features quite modern looking graphics, which might mean that Crypto have dropped their initial style of developing old fashioned, comics a-like games. Free spins feature and a second screen bonus game should certainly keep you busy for a bit on this 5 reel, 25 pay-line game. Batman – DC comic hero and a character that is known across the globe. NYX have developed a pretty good 50 pay-line video slot about him and it’s available at Inter Casino! While the game isn’t anything exceptional, it is quite entertaining to play, features a bonus game and a free spins feature. Captain Nemo – a fairytale about a sailor who is on a journey across the globe turned into an online slot machine by Cryptologic. I believe that the main reason of its popularity is the sizable progressive jackpot offered at it, which was at $640,000 at the time of writing this review. Though, there have been a couple of multi-million dollar payouts it has awarded. Just Vegas – an online slot themed after the fabulous city that is pretty much heaven for gamblers and those loving entertainment. The slot itself actually does look like a Vegas style slot machine too with shiny details and symbols such as cash bricks and cocktails on the reels. The game uses a concept, known as all-pays. New player? If you don’t have an account at Inter Casino, make one now and claim a 100% bonus, up to €500!The bonus is offered to all new players, with no country restrictions, as long as players from your country are accepted by InterCasino. If you claim this offer, you’ll have to rollover 20x your bonus + deposit. If you happen to claim the full bonus amount of €500, total wagering amount needed will be €20,000. On top of the welcome bonus offer, you can also participate in any casino promotions offered by Inter Casino as well as in their VIP loyalty scheme. What they have is an extraordinary lounge for VIP players, which isn’t your usual scheme giving back a certain amount of money for your wagers placed. InterCasino is using a third party company for processing deposits and withdrawals, known as eCash. The company have been in the industry since 1996, when it was launched, and during that time transactions exceed they’ve processed exceed 20 billion. Withdrawals are processed quite effectively and usually within 24 hours, while deposits are instant with most methods. Over 50 payment types and methods are accepted too with credit, debit cards making that list as well as e-wallets and most popular prepaid cards. Live Chat – available during business hours. Because you’ll get a safe, secure gambling experience from a company as old as the industry itself. They have served 2 million casino players and paid out over 20 billion in winnings! Their games can be played with no download necessary and are powered by Cryptologic, Aristocrat and NYX Interactive.